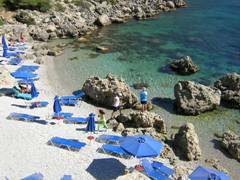 Let's get wet - the best beaches on Rhodes Island. The question is how do you like to get wet? What sort of scenery do you like at your beach? You see, in Rhodes island we like to cater to your liking and so we have a wide variety of beaches; all of them waiting for you. With almost 250 kilometers of sea coast, you can understand why we boast about it. If there is one thing we Rhodians know about is how to bake in the Sun, and so we do not like to go to the same place all of the time. 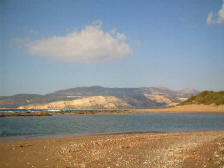 From the rocky beaches, some almost forgotten, of the North-western coast of Rhodes to the sandy beaches of the South. It is like we say everything under the Sun. Let us tell you what we mean. 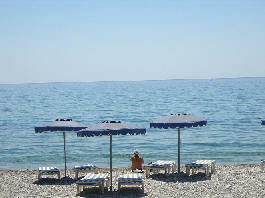 We have beaches with white sand such as Tsambika and Prasonissi. We have beaches for windsurfing. 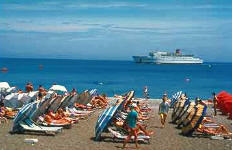 We have serene and calm beaches in the South, or if you like, bustling party beaches of Faliraki and Rhodes Town. You see, we are serious about our beaches, and about our fun and relaxation. And you do not have to worry about Spielberg showing up because we have no sharks roaming around! Besides, we have trained some cool guys (Watch out Baywatch!) for the Red Cross and they maintain a high level of safety. Do we have a rainy season? Yes, but nothing like the Caribbean. You do not have to worry because our seasons do not include hurricanes, nor typhoons, nor tropical storms. (However we have copies of Twister in video if you like, and we'll even throw a bucket of water on you while you watch it.). But seriously, you do not have to worry about a few drops bothering you because our seasons are early spring and late fall. Another thing which you can enjoy right at the beach during the day is the fish, cooked right at the beach, and served fresh. It is delicious, or if you like, at night you can take a walk to enjoy the cool sea breeze. (No pun intended). 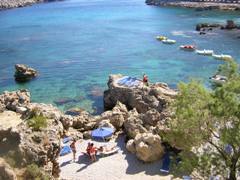 But if you like to go under, we have a breathtaking coast where you will enjoy scuba diving. You can rent a motored boat, or a sail boat, but you can also chart a boat with crew to take you for a spin. Yet again, if you are an exercise freak, you can rent windsurfing equipment, or paddle boats and paddle to your heart's content. If you do not want to do so, that's fine too. No problem! We hope that you realize how serious we are about our beaches! Come relax, get wet, play ball, sail, scuba, swim, whatever you like to do in the summer, but do not miss the experiences and the great memories. Now it's your chance, don't miss it!